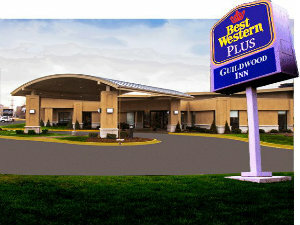 You’ll find hospitality Best Western PLUS style at the Guildwood Inn. Constant attention exceeding your expectations sets the Guildwood Inn apart from others. Each standard guestroom, executive room and suite has been completely updated. All rooms are non-smoking and include, in-room coffee makers, hairdryers, 42″ LCD televisions, pillow top beds, refrigerators and free high speed wireless internet access., Other amenities include seasonal outdoor swimming pool, fitness facility, valet service, newspapers, free local calls and close to many area attractions. In addition we are pet friendly hotel.